This collection of vintage Trifari jewelry from the 1930s, 1940s, and 1950s includes double-clip brooches, earrings, brooches, and sets. 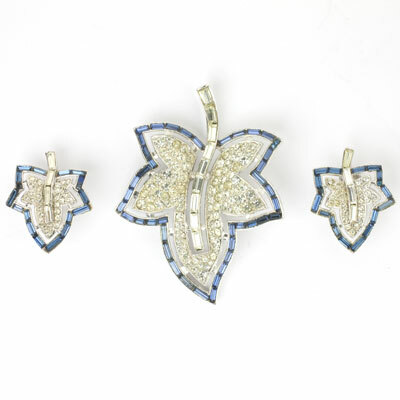 A company known for its distinctive style of imitating fine jewelry and its high-quality crystals and highly-skilled craftsmanship, Trifari was nicknamed “The Rhinestone Kings”. Many pieces here were designed by Alfred Philippe, chief designer from 1930-1968. Based on his prior experience with fine jewelry, Philippe introduced many successful lines, including fruit salads (known as tutti frutti in fine jewelry). 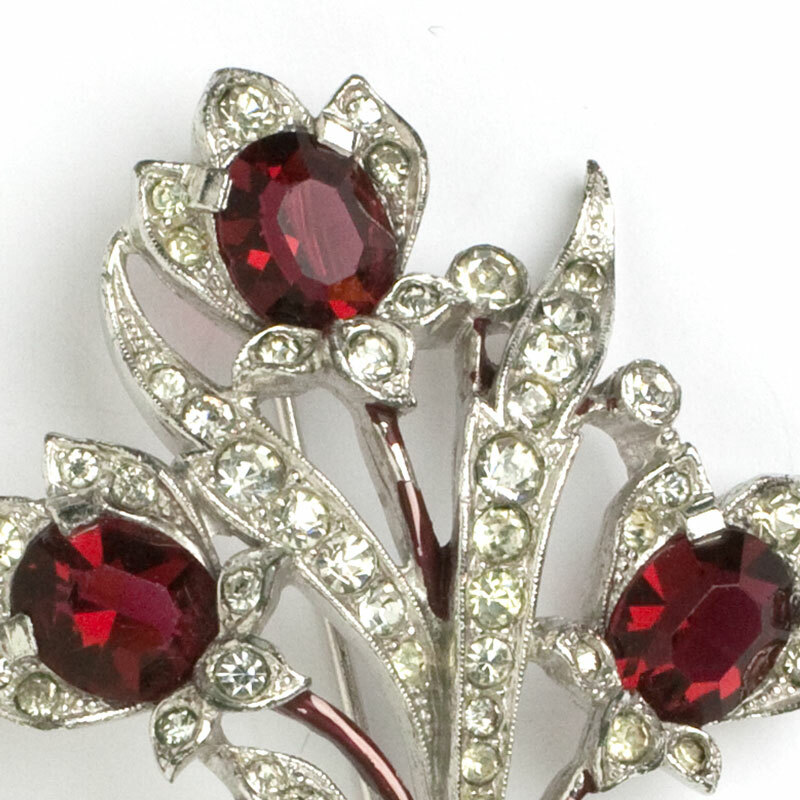 Trifari patented their first double-clip brooch in 1932. Alfred Philippe’s design, patented in 1936, became known as Clip-Mates. Read more about Trifari. 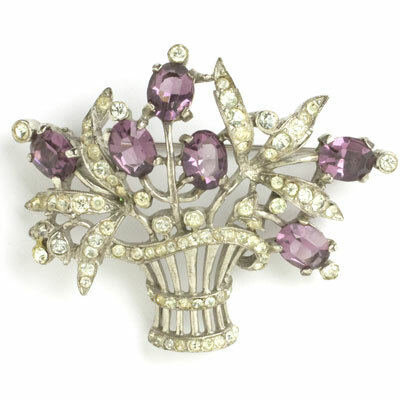 This flower basket brooch by Trifari is a romantic design from the 1940s. It features faceted, oval aquamarine-glass flowers among diamanté leaves in a diamanté-trimmed basket. The setting is rhodium-plated sterling silver; the pin closes with a roll-over safety clasp. This design is a classic, and the aquamarine stones are lovely. Two other brooches in this design are available: one has ruby flowers; the other, amethysts – scroll down to see them. All three pieces were from my personal collection. You could wear them together on your shoulder for a unique embellishment! 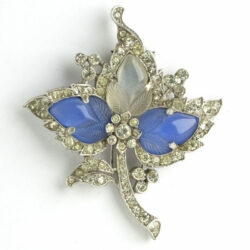 This Trifari dress clip is a 1941 Alfred Philippe design. It features fruit salads in translucent chalcedony and moonstone, surrounded by diamanté in a rhodium-plated setting. This graceful, beautifully-detailed piece is shaped like a maple leaf. You can wear it as a brooch – the hinged, double-prong fastener works well with weighty fabrics. Or wear the clip as a pendant. The third photo shows this piece attached to a sterling chain (which is not included with the clip) – I wanted you to see how lovely this combination looks. 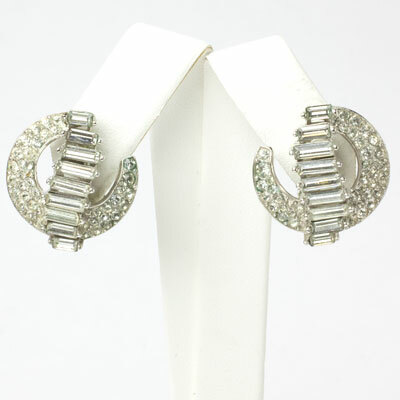 These Trifari ear clips from the mid- to late-1950s are diamanté-embellished crescents. A stack of baguettes positioned horizontally forms the focal point of each one. The setting is rhodium-plated metal. Designed to frame your face, this pair has a definite left and right earring. Just simply elegant to wear every day or for a special occasion! 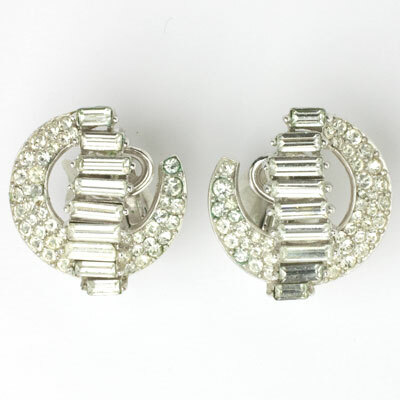 Trifari costume jewelry of the late-1930s included Clip-Mates, their version of the double clip brooch. This example features loops of diamanté-encrusted ribbons. The setting is rhodium-plated. 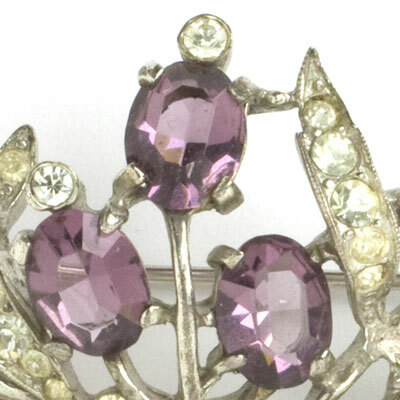 This piece can be worn as a brooch (at different angles, as shown) or as two separate dress clips. The photos show a third option: one clip worn as a pendant on a sterling silver chain (which is not included). A white-gold one would also work well. Wear this piece with faux or real diamond studs for an added touch of sparkle. Scroll down to see a selection of coordinating bracelets. You can see the utility patent for the brooch mechanism here, shown below Trifari's name. This Trifari fruit salad piece was designed by Alfred Philippe. It features the company's popular trio of acorn-shaped, molded glass to imitate carved gemstones (rubies, sapphires, and emeralds). This design is one example of Trifari's Clip-Mates, their answer to Coro's Duette. 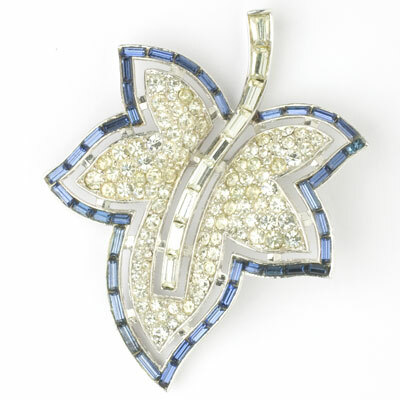 This piece can be worn as a brooch or as separate dress clips. The influence of Cartier and Van Cleef & Arpels on Philippe is evident in the fruit salad lines he designed for Trifari in the mid-1930s and early 1940s. The setting of this special early piece is rhodium-plated metal with diamanté accents. The pin closes with a roll-over safety clasp. You can see the utility patent for the brooch mechanism here, shown below Trifari's name. Scroll down to see a fruit salad bar brooch, also by this maker but with stones in a different shape. 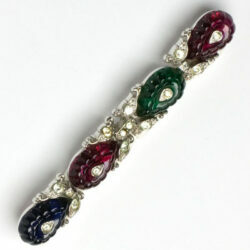 This 1930s bar brooch features a line of teardrop-shaped ruby, emerald, and sapphire-glass stones topped with and surrounded by diamanté. The molded glass was used by costume jewelry makers to imitate the Indian-carved gemstones – known as fruit salads or tutti frutti – which were so popular in the Art Deco era. Trifari made their first fruit salad pieces in the late-1930s, typically using acorn-shaped stones. 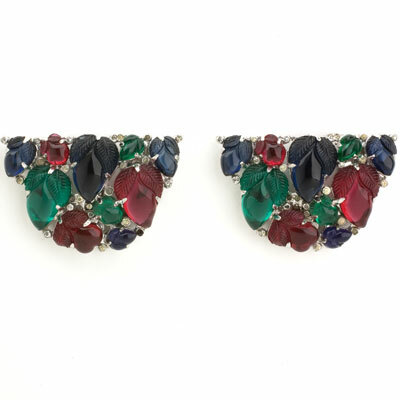 This piece has the popular trio of colors but in a different shape with an added gem: the company called cabochons with a diamanté center shoe-buttons. The design of this rhodium-plated setting is similar to pieces from the company's Ming series in the 1930s. The pin closes with a roll-over safety clasp. 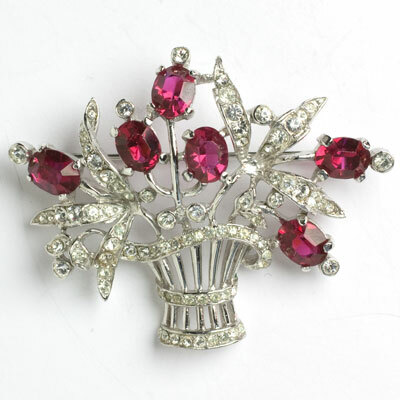 This brooch goes with just about everything! 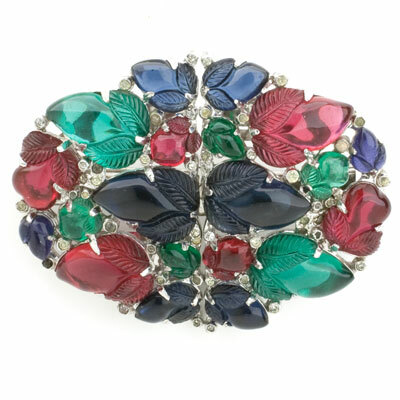 Scroll down to see an early Trifari fruit salad double-clip brooch (Clip-Mates) in the same colors. 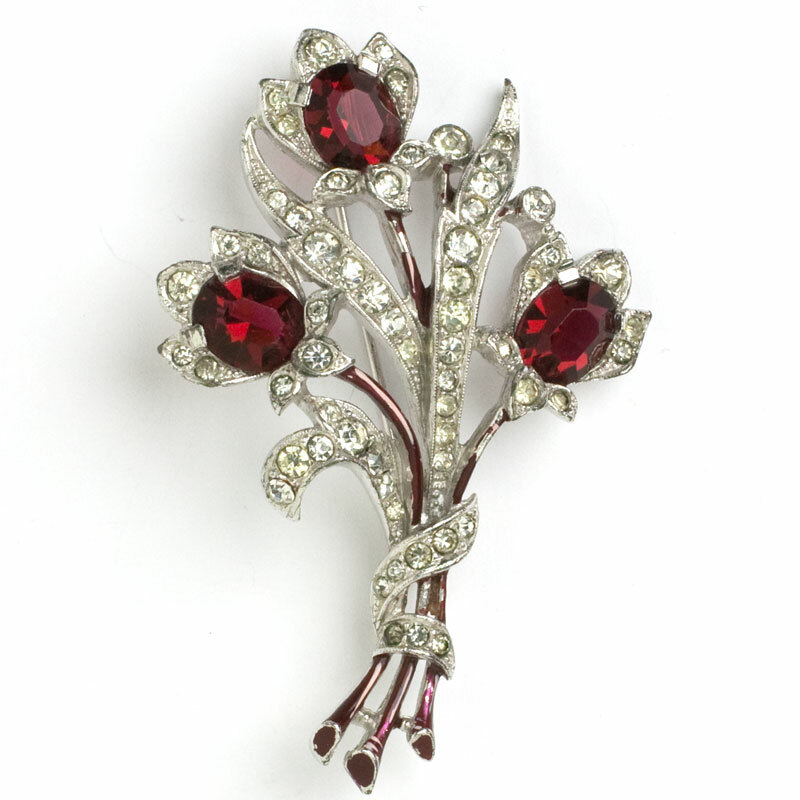 This Trifari bouquet brooch has enamel leaves with faceted, oval ruby-red glass flowers surrounded by pavé petals. Long pavé leaves and a pavé ribbon that ties the bouquet complete this graceful Alfred Spaney design. 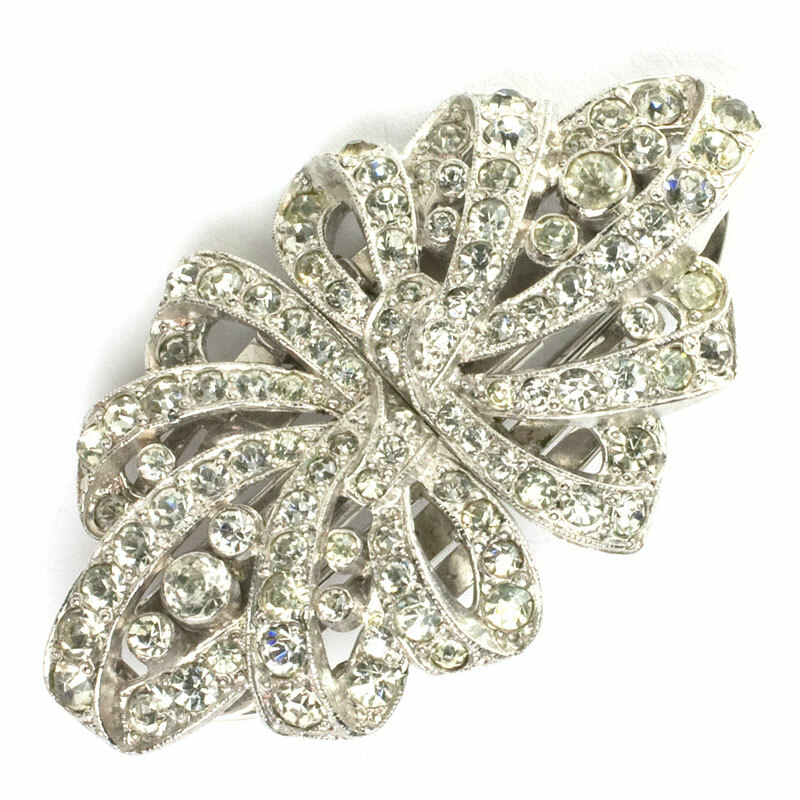 This lovely and timeless 1940s brooch closes with a roll-over safety clasp. 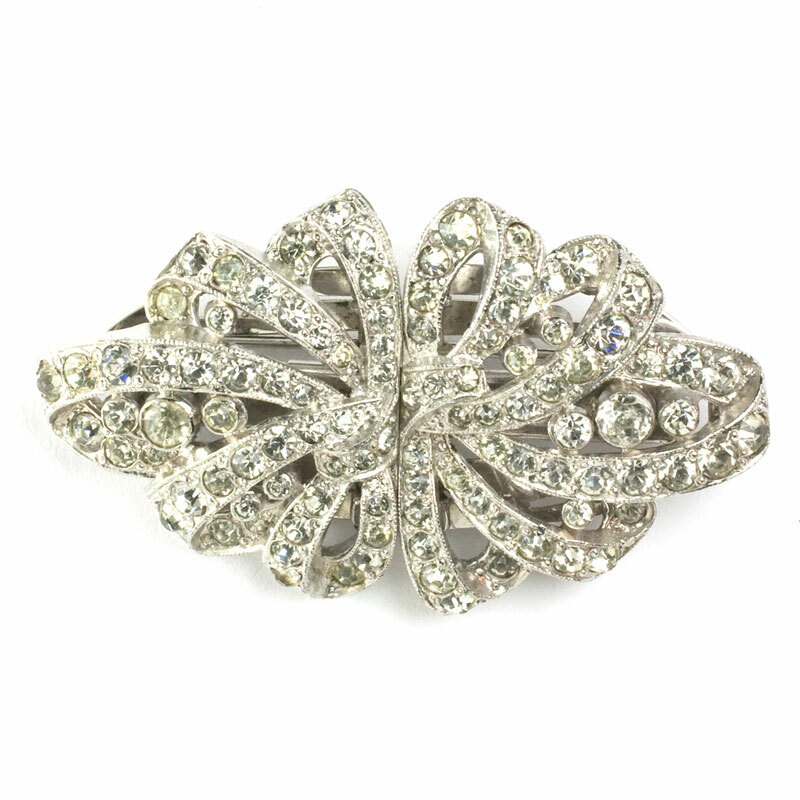 This Trifari brooch from the 1940s is a flower basket design in the Victorian Revival style. 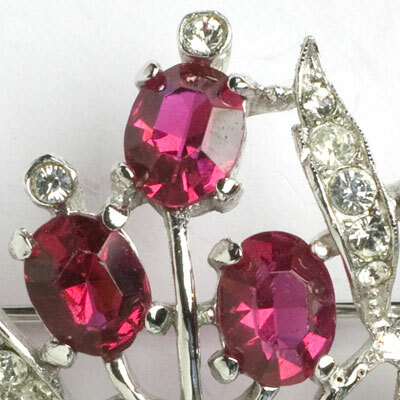 It has faceted, oval ruby-glass flowers surrounded by diamanté leaves in a diamanté trimmed basket. The setting is rhodium-plated sterling silver; the pin closes with a roll-over safety clasp. Two other brooches by this maker in this design are available: one has aquamarine flowers; the other, amethysts – scroll down to see them. All three are from my personal collection. You could wear one, two, or all together, creating unique looks each time! 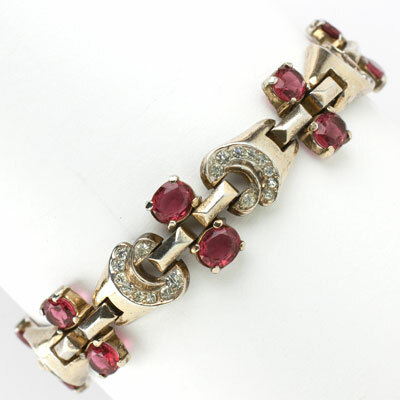 This Trifari bracelet was made during WWII, when costume jewelry makers had to use sterling silver because base metals were limited to war-related manufacturing. 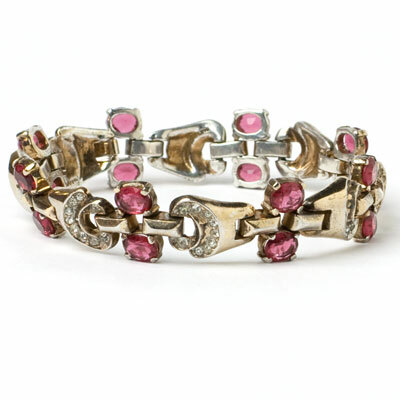 This piece features pairs of facing scroll-shaped links adorned with diamanté. 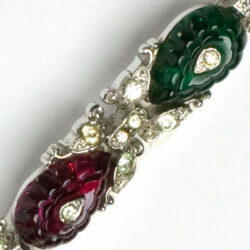 Each pair is separated by a pair of faceted, oval, prong-set ruby-glass stones. Simple flat gold links hold the elements together and end with a fold-over clasp. The red stones really complement the gold-washed setting. This lovely bracelet can be worn anytime, anywhere. 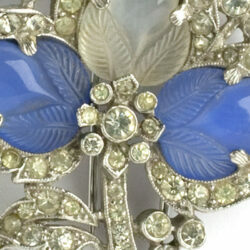 This Trifari leaf brooch and ear clips set was named Jeweleaf. 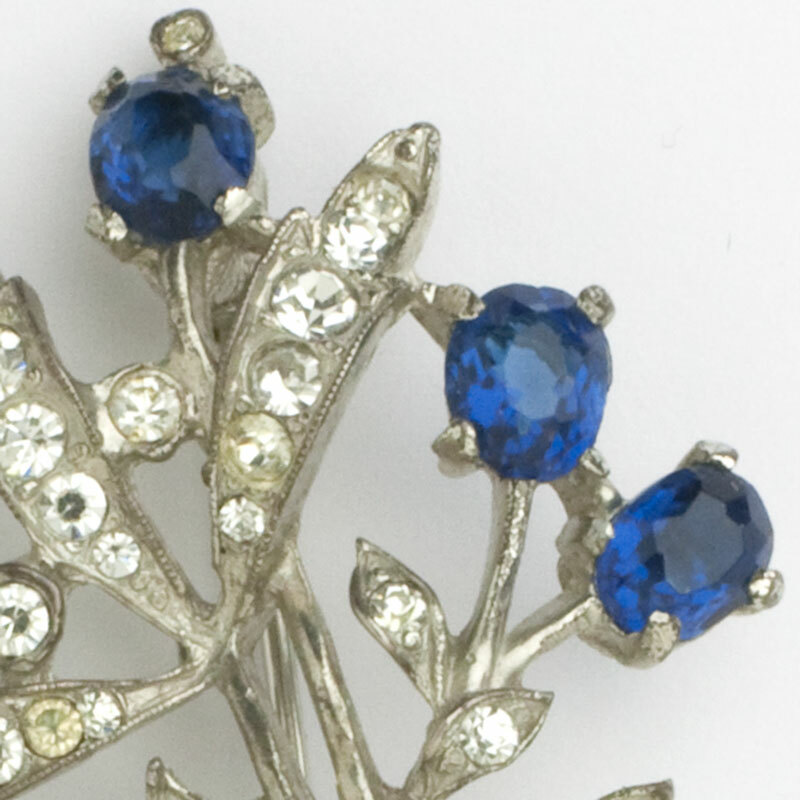 Designed by Alfred Philippe in 1951, it features diamanté-paved maple leaves outlined with sapphire-glass baguettes. The setting is rhodium-plated base metal. The pin closes with a roll-over safety clasp. An all-diamanté version, described as “platinum-toned … paved with stones” and “one of two charming variations on a Spring theme”, was advertised in the February 1, 1952 issue of Vogue. The brooch was $17.50, and the earrings were $15.00, for a total of $32.50. (In 1950, the average U.S. family’s income was $81.50 per week.) Note that the photo of the brooch alone shows it in the position indicated in the design patent (last photo), but you can wear the jewel in any position you wish. Scroll down to see the perfect bracelet to wear with this set. Floral bouquets were a popular theme for Trifari and other costume jewelry makers during WWII. 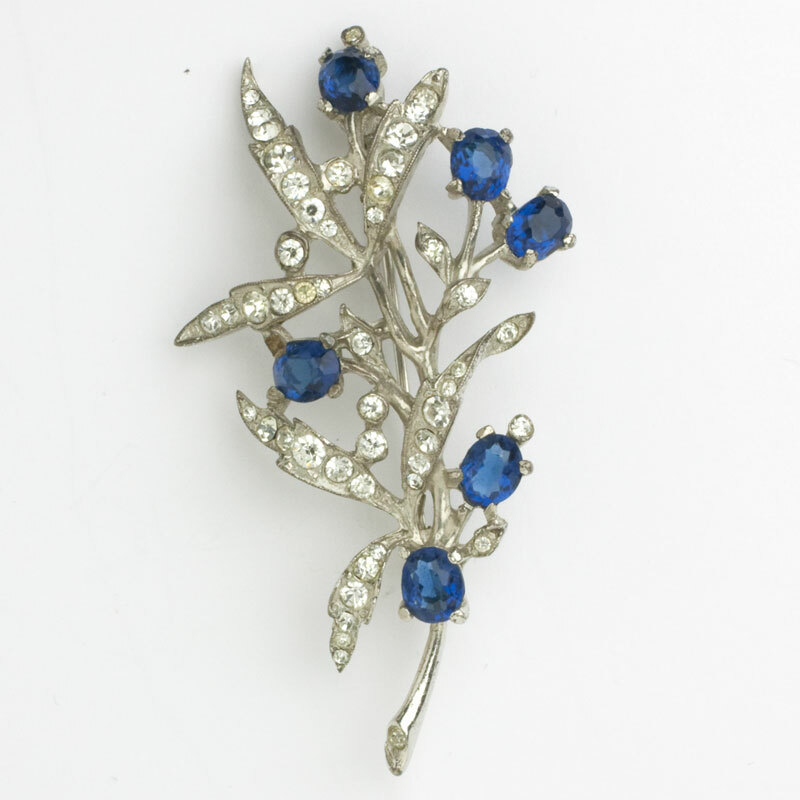 This design is horizontal in format, with faceted, oval sapphire-glass flowers, diamanté leaves, and silver stems. The setting is rhodium-plated sterling silver. The roll-over safety clasp has been replaced by my expert jeweler. Pieces like this one are easy to wear with modern jewelry – just add simple diamond (faux or real) studs or hoops to complete your jeweled accessories.